The Talented Mr. Ripley is a 1999 American psychological thriller film written for the screen and directed by Anthony Minghella. An adaptation of Patricia Highsmith's 1955 novel of the same name, the film stars Matt Damon as Tom Ripley, Jude Law as Dickie Greenleaf, Gwyneth Paltrow as Marge Sherwood, Cate Blanchett as Meredith Logue, and Philip Seymour Hoffman as Freddie Miles. The novel was previously filmed as Purple Noon in 1960. Tom Ripley is a young man struggling to make a living in 1950s New York City with his "talents": telling lies, forging signatures and impersonating people. While working at a party as a piano player, he is approached by wealthy shipbuilder Herbert Greenleaf, who mistakenly believes that Ripley attended Princeton with his son, Dickie. Greenleaf recruits Ripley, for $1,000, to travel to Italy to persuade Dickie to return home. After the voyage while collecting his luggage, Ripley strikes up a friendship with an American socialite, Meredith Logue, and pretends to be Dickie. In the Italian seaside town of Mongibello, Ripley charms himself into the lives of Dickie and his fiancée, Marge. Ripley becomes infatuated with Dickie's extravagant lifestyle; he also becomes obsessed with Dickie himself. Eventually, however, Dickie tires of him and starts spending more time with his Princeton friend Freddie Miles, a womanizer who treats Ripley with contempt. When Dickie impregnates a local woman, he rejects her and she drowns herself. Only Ripley knows what happened, and he promises to keep it a secret. One night, Dickie catches Ripley dressed in his clothes and pretending to be him in front of a mirror, which further alienates him from Ripley. When Dickie's father cuts off Ripley's travel funds, Dickie cancels a planned trip to Venice and tells Ripley they should part ways, but offers to take him on a short, final trip to San Remo. They take a boat out, but when Ripley suggests they move in together, Dickie says he has grown tired of him and is going to marry Marge. The two fight, and Ripley beats Dickie to death with an oar. Ripley scuttles the boat in a nearby cove. Realizing that people easily mistake him for Dickie, Ripley decides to steal his identity. He forges a letter to Marge, convincing her that Dickie has left her to live in Rome. He creates the illusion that Dickie is still alive by checking into one Roman hotel as Dickie and another as himself, creating an exchange of communications between the two. Through forgery, he is able to draw on Dickie's allowance, which allows him to live lavishly. He runs into Meredith, who believes that Ripley is actually Dickie; Ripley pretends to romance her to gain access to her wealthy circle of friends. His ruse is threatened when Marge arrives in Rome, so he breaks it off with Meredith to prevent himself from being exposed. Freddie shows up at Ripley's apartment looking for Dickie and is immediately suspicious. When the landlady addresses Ripley as Dickie, Freddie realizes the fraud, but Ripley beats him to death with a stone bust before he can tell anyone. After disposing of the body, Ripley is forced into a cat-and-mouse existence between the Italian police and Marge. Realizing that the police suspect Dickie of murdering Freddie, Ripley forges a suicide note, with "Dickie" claiming responsibility for Freddie's death. Ripley then travels to Venice, where he meets Marge's friend, Peter Smith-Kingsley, and they become very close. Dickie's father travels to Italy to meet with the police, bringing along a private detective, Alvin MacCarron. Ripley prepares to kill Marge when she discovers Dickie's rings in his possession and begins to deduce what has been going on, but Peter interrupts them. Mr. Greenleaf dismisses Marge's suspicions, and MacCarron reveals to Ripley that the police are convinced that Dickie, who had a history of violence, murdered Freddie before killing himself. MacCarron further indicates that out of appreciation for Ripley's loyalty to Dickie—and to assure Ripley's silence—Mr. Greenleaf intends to bequeath Dickie's trust fund to Ripley. Free and clear of his crimes, Ripley boards a ship to Greece with Peter; it is implied that they are now lovers. Ripley is surprised to encounter Meredith, who knows him as Dickie and also knows Peter socially. Killing Meredith to avoid being exposed as an impostor is impossible because she is traveling with family. Ripley returns to his cabin, where Peter confronts him about knowing Meredith; a sobbing Ripley then strangles Peter, and returns to his cabin, alone. The Guardian reported in 2000 that Leonardo DiCaprio declined the offer to play Ripley before Damon was cast in the role. Apart from the beginning scenes filmed in New York City, the movie was shot entirely on location in Italy. The cliffside resort town of Positano and various villages on the islands of Ischia and Procida, near Naples, were used to represent the fictional town of "Mongibello". The scenes taking place in San Remo were actually filmed in Anzio, a resort-town near Rome. Famous locations included the Piazza Navona, the Spanish Steps and Piazza di Spagna in Rome, and the Caffè Florian in the Piazza San Marco, Venice. To prepare for the role of Ripley, Damon lost 30 pounds and learned to play the piano. Jude Law gained weight and learned to play the saxophone for his character; he also broke a rib when he fell backward while filming the murder scene in the boat. Roger Ebert gave the film four-out-of-four stars, calling it "an intelligent thriller" that is "insidious in the way it leads us to identify with Tom Ripley ... He's a monster, but we want him to get away with it". In her review for The New York Times, Janet Maslin praised Law's performance: "This is a star-making role for the preternaturally talented English actor Jude Law. Beyond being devastatingly good-looking, Mr. Law gives Dickie the manic, teasing powers of manipulation that make him ardently courted by every man or woman he knows". Entertainment Weekly gave the film an "A-" rating, and Lisa Schwarzbaum wrote: "Damon is at once an obvious choice for the part and a hard sell to audiences soothed by his amiable boyishness ... the facade works surprisingly well when Damon holds that gleaming smile just a few seconds too long, his Eagle Scout eyes fixed just a blink more than the calm gaze of any non-murdering young man. And in that opacity we see horror". Charlotte O'Sullivan of Sight and Sound wrote, "A tense, troubling thriller, marred only by problems of pacing (the middle section drags) and some implausible characterisation (Meredith's obsession with Ripley never convinces), it's full of vivid, miserable life". Time named it one of the ten best films of the year and called it a "devious twist on the Patricia Highsmith crime novel". James Berardinelli gave the film two and a half stars out of four, calling it "a solid adaptation" that "will hold a viewer's attention", but criticized "Damon's weak performance" and "a running time that's about 15 minutes too long." Berardinelli compared the film unfavorably with the previous adaptation, Purple Noon, which he gave four stars. He wrote, "The remake went back to the source material, Patricia Highsmith's The Talented Mr. Ripley. The result, while arguably truer to the events of Highsmith's book, is vastly inferior. To say it suffers by comparison to Purple Noon is an understatement. Almost every aspect of René Clément's 1960 motion picture is superior to that of Minghella's 1999 version, from the cinematography to the acting to the screenplay. Matt Damon might make a credible Tom Ripley, but only for those who never experienced Alain Delon's portrayal." In his review for The New York Observer, Andrew Sarris wrote, "On balance, The Talented Mr. Ripley is worth seeing more for its undeniably delightful journey than its final destination. Perhaps wall-to-wall amorality and triumphant evil leave too sour an aftertaste even for the most sophisticated anti-Hollywood palate". In his review for The Guardian, Peter Bradshaw wrote, "The Talented Mr. Ripley begins as an ingenious exposition of the great truth about charming people having something to hide: namely, their utter reliance on others. It ends up as a dismayingly unthrilling thriller and bafflingly unconvincing character study". In her review for the Village Voice, Amy Taubin criticized Minghella as a "would-be art film director who never takes his eye off the box office, doesn't allow himself to become embroiled in such complexity. He turns The Talented Mr. Ripley into a splashy tourist trap of a movie. The effect is rather like reading The National Enquirer in a café overlooking the Adriatic". On Rotten Tomatoes the film has an approval rating of 83%, based on reviews from 129 critics, with an average rating of 7.3/10. On Metacritic the film has a weighted average score of 76/100 based on reviews from 35 critics, indicating "generally favorable" reviews. Audiences surveyed by CinemaScore gave the film a grade C+. ^ a b The Talented Mr. Ripley (1999). Box Office Mojo. IMDb. Retrieved February 23, 2012. ^ Ojumu, Akin (January 30, 2000). "Bad will hunting". The Guardian. London, England: Guardian Media Group. Retrieved February 18, 2016. ^ a b "Film locations for the Talented Mr. Ripley". movie-locations.com. Retrieved May 30, 2017. ^ Interview with Matt Damon – Mr. Ripley. YouTube. November 14, 2009. Retrieved May 30, 2017. ^ The Talented Mr. Ripley: Jude Law Exclusive Interview. YouTube. January 14, 2015. Retrieved May 30, 2017. ^ Ebert, Roger (December 24, 1999). "The Talented Mr. Ripley". Chicago Sun-Times. Chicago, Illinois: Sun-Times Media Group. Retrieved July 6, 2009. ^ Maslin, Janet (December 24, 1999). "Stealing a New Life, Carnal, Glamorous And Worth the Price". The New York Times. New York City: New York Times Company. Retrieved July 6, 2009. ^ Schwarzbaum, Lisa (January 7, 2000). "The Talented Mr. Ripley". Entertainment Weekly. New York City: Meredith Corporation. Retrieved July 6, 2009. ^ O'Sullivan, Charlotte (March 2000). "The Talented Mr. Ripley". Sight and Sound. Archived from the original on May 11, 2012. Retrieved July 6, 2009. ^ Berardinelli, James. "The Talented Mr. Ripley". ReelViews.net. Retrieved October 14, 2011. ^ Berardinelli, James. "Purple Noon (Plein Soleil)". ReelViews.net. Retrieved October 14, 2011. ^ Berardinelli, James. "James Berardinelli Top 100: #86: Purple Noon". ReelViews.net. Retrieved October 14, 2011. ^ Sarris, Andrew (December 26, 1999). "The Year at the Movies: Overlong, Overambitious". The New York Observer. New York City: Observer Media. Retrieved July 6, 2009. ^ Bradshaw, Peter (February 25, 2000). "The Talented Mr. Ripley". The Guardian. London, England: Guardian Media Group. Retrieved July 6, 2009. ^ Taubin, Amy (December 21, 1999). "From Riches to Rags: Ugly Americans and Plucky Irish". Village Voice. New York City: Voice Media. Retrieved July 6, 2009. ^ "The Talented Mr. Ripley (1999)". Rotten Tomatoes. Los Angeles, California: Fandango Media. Retrieved January 29, 2019. 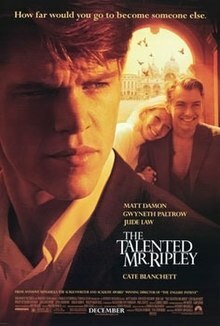 ^ "The Talented Mr. Ripley". Metacritic. ^ "Talented Mr. Ripley, The (1999)". CinemaScore. Retrieved February 17, 2019. ^ "Nominees & Winners for the 72nd Academy Awards". Academy of Motion Picture Arts and Sciences (AMPAS). Archived from the original on November 9, 2014. ^ "Film in 2000". BAFTA Awards. Retrieved February 14, 2019 – via awards.bafta.org. ^ Higgins, Bill; Gray, Tim (December 20, 1999). "Globes' Beauty pageant". Variety. Los Angeles, California: Penske Media Corporation. Retrieved February 14, 2019. ^ "1999 Award Winners". National Board of Review. Retrieved February 14, 2019.